So, I went to an Old School Throwback Jam concert last night, which was basically an 80’s dance party. It only took up 1/2 of the concert arena because they couldn’t sell enough tickets to fill the whole place. But it felt like the whole city was there as no one sat down for the entire concert, but instead stood up and sang every song and danced. 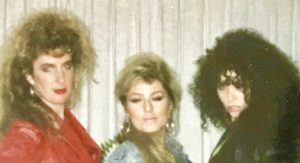 If you were lucky enough to be in your 20’s in the 1980’s my guess is you are smiling right now remembering the days of dancing with your girlfriends with your big hair and shoulder pads. And also you are remembering that we sweated, were silly, tried new dance moves and looked like a dork, but we didn’t care! There were no iPhones to capture the moment. It was just the moment right then and there. There was nothing better than hanging with girlfriends and dancing for hours on a Friday night. Maybe the 20 somethings nowadays have that same feeling of freedom and invincibility as I did then. Maybe it is just an age thing. But there is something to be said for being able to let loose and dance without worrying that your picture is going to appear on social media the next day in an unflattering pose. Don’t get me wrong, I am a fan of social media, as I love using Instagram and writing my blog. I didn’t have these outlets in the 80’s. But I just wonder if being in the moment now is a lost art. I have to remind myself now to be in the moment. I have to remember to breathe, and really “think” about being in the moment, which seems ironic. I didn’t used to have to remind myself to be in the moment. When I hear the 80’s music the memories that come back to me are filled with movement, laughing, sweating and leaving every last drop of energy I had out on the dance floor. I don’t have many pictures of these days and I wish I did. For all the times I went out dancing, I only found one picture. It was in the days when the photos had the date printed on them, so I know the picture was taken January 18th, 1989. I don’t remember who took the picture or whose house we were in, but I do remember my blonde friend I was with; Kathryn. We met at my first job out of college. She was a rebel who took ecstasy and didn’t go to college but instead travelled Europe with her college money. She was worldly to me as she seemed to live her life free of the constraints of what others thought of her. She dated a Persian man in the days when that was considered taboo. He had only been in the country for a few years and had a charming accent and a bunch of mysterious Persian friends who were beautiful with their dark eyes and shy smiles. I admired her because she just seemed to know what she wanted and didn’t care what others thought. She helped me get my first apartment when I took a job in San Francisco. An acquaintance of hers needed a roommate, and she gave me her number. I lost touch with her shortly after that. It was almost as if she came into my life to help me transition from college to the real world, and then she was gone. 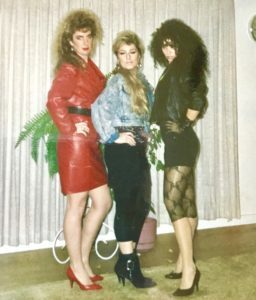 I moved into San Francisco and worked in the financial district as the 80’s became the 90’s. Now, I had rent to pay and a career to focus on, so although I still went out dancing, it wasn’t the same uninhibited freedom I felt before as I started to focus on getting serious about my life. Most of what is left of the 80’s is in my foggy memory, but it seems to all come back when I listen to that music. That feeling that the world was mine. I was powerful with my big hair and big shoulder pads, and it meant something that I knew all the words to the Rob Base and DJ E-Z song, “it takes two”. That was important! That is why last night when I was at the concert I stood up for the entire concert with everyone else there and danced and sang all the songs, and I was sad when it was over. Last night that girl that lived in the moment without thinking about it was back, and it felt great!